MEXICO CITY (CNS) -- Cardinal-designate Luis Hector Villalba of Tucuman, Argentina, was watching the Angelus prayer from the Vatican on television Jan. 4 when he heard Pope Francis -- an old colleague and countryman -- read his name as one of 20 new cardinals. He then went to the Santa Cruz chapel in Tucuman, 775 miles northwest of Buenos Aires, where the octogenarian celebrated Sunday Mass for barrio dwellers. Cardinal-designate Villalba was to become one of 20 prelates elevated to cardinal in ceremonies at the Vatican Feb. 14. He is one of five new cardinals over the age of 80 and ineligible to vote in a future papal conclave. Still, his elevation sends a signal of the kind of church Pope Francis wants to promote in which a pastoral approach is preferred and those living on the periphery are placed in prominent positions. "The new Argentinian cardinal was and is a priest, a shepherd with the smell of sheep," journalist Hector Tito Garabal wrote on his news website Infobae. He has known Cardinal-designate Villalba for more than 40 years. Garabal described his friend as an exemplary priest and bishop. "Once he became a bishop, he never stopped being a priest. One virtue of Villalba ... is that he has always been a priest," he said. Cardinal-designate Villalba could be credited with showing Pope Francis -- Jorge Mario Bergoglio -- the pastoral approach he is promoting today. As auxiliary bishop of Buenos Aires, he was vicar in the Flores district of the diocese, which includes Pope Francis' birthplace. The pope succeeded him in 1992 and said he only had to continue doing the same "because Villalba has left everything sown," Garabal said. 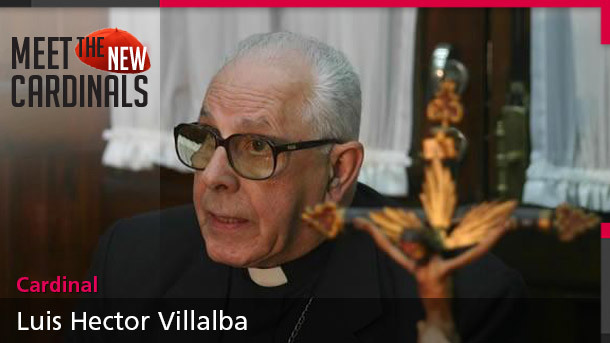 Cardinal-designate Villalba was born in Buenos Aires, Oct. 11, 1934. He was ordained in 1960 and, after studying in Rome, he was named a parish priest in the Argentine capital. There, he was known for overhauling the local Caritas from being a food and clothing bank to an organization known for serving people who came with more than material needs, Garabal said. He was appointed auxiliary bishop of Buenos Aires in 1984 and bishop of San Martin in 1991. In 1999, he became archbishop of Tucuman, where he stayed after retiring in 2009. Cardinal-designate Villalba was active in the Argentine bishops' conference, serving twice as vice president and working with the then-president, Archbishop Jorge Mario Bergoglio of Buenos Aires -- acting as a sort of troubleshooter. "He worked actively with Bergoglio in the Argentine bishops' conference," said Jose Maria Poirier, publisher of the Catholic magazine Criterio in Buenos Aires. "He faced very complicated and difficult situations in some dioceses." One situation was a scandal in the Diocese of Santiago del Estero, where the well-liked bishop, known for his work with the poor, resigned after being caught on tape with a male lover in what many, including some in the church, considered revenge for his denouncing political corruption. "Villalba had to confront this difficult situation with great balance, without deteriorating the image of his predecessor and continuing his work," Poirier said. "Always in conflictive situations in other dioceses or the conference, Villalba was a man of moderation, acting as a bridge, and finding agreement." Cardinal-designate Villalba still acts as a pastor in Tucuman. He is in charge of the Holy Cross chapel and is catechism director at St. Martin de Porres Parish.